A tender, hearty, healthy lamb stew for any occasion. 4 pounds lamb shoulder chops with bone or 2 1/3 pounds boneless lamb stew meat, trimmed of fat and cut into 1 to 1 1/2 inch pieces. Meat that clings to the bones is fine – it will come off easily after cooking. Brown meat Pat the meat dry. Spread it onto a wax paper-lined baking pan in a single layer. Sprinkle with salt and pepper, toss. Sprinkle with flour and toss to coat. Shake off excess flour by tossing meat in a mesh colander or strainer before browning. Heat 2 tablespoons oil over medium heat in a large skillet until hot. Brown lamb on all sides in two or three batches, 3-4 minutes per batch, adding more oil if necessary. 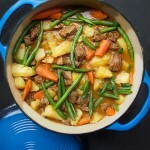 Transfer browned lamb to a large stew pot or Dutch oven. Assemble Stew Add onions to the skillet and sauté, stirring, for a few minutes, until lightly browned. Add them to the stew pot. Pour the Guinness or Vermouth into the skillet and deglaze, stirring with a wooden spoon to get off any browned bits of meat or onion. Pour the liquid into the stew pot along with the garlic, tomato paste, 3 cups of chicken broth, and rosemary. (ingredients should just barely be covered with liquid) Bring to a simmer, cover and cook for 1 hour. Blanch Green Beans Bring a large pot of salted water to a boil over high heat. Drop the beans in and cover to help bring the water back to boil quickly. Remove the cover and boil beans for about 3 minutes, until just crisp tender. Drain and plunge beans quickly into a big bowl of ice water to keep them crisp and green. Finish the Stew Remove bones (if using) and degrease cooking liquid by letting the fat rise to the surface for a few minutes and skimming it with a spoon or by cooling the stew in the fridge for several hours or overnight, and scraping the fat off the top. Stew can be made ahead to this point and stored in the fridge for up to two days. Bring stew back to a simmer before continuing. Season broth with salt and pepper, to taste. Bury carrots and potatoes in the stew, adding 1 extra cup of broth if necessary. Bring to a boil. Quickly lower to a simmer. Cover and cook for 25-30 minutes, until vegetables are tender. Drain beans and bury them in the stew along with the peas. Cover and cook for 5 minutes, until beans and peas are hot. Correct seasoning. Enjoy!